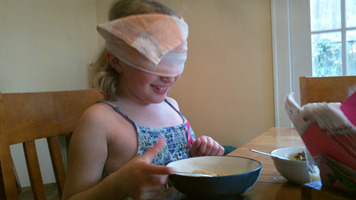 As part of her Coyote Kids class, she was to eat her dinner blindfolded last night. She was excited to hear we were having soup, as it was relatively easy to do. There was a fair amount of peeking, as the thrill quickly faded. Supposedly they did the same thing in her class, and Emma claims to have run into the same tree sixteen times. Sam continues to have stomach pain, and has started in on his medication this morning. I was talking to Jamie this morning and when she picked up Sam's homework yesterday, the secretary said a lot of kids had similar symptoms. He's missing his choir performance tonight. Hopefully he'll perk up by this weekend. Poor guy. Joanna and I are going out for dinner tonight. The next couple days are relatively low-key. 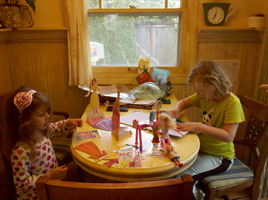 Sam has a lot of homework to catch up on, and Emma has a Dolley Madison project to finish. Joanna pointed out that mother's day is coming up soon, and I'll probably put some effort into that. Sam needs a haircut, shoes, and pants. If it's nice on Sunday as predicted, I'd love to get outside. Otherwise, I'm hoping for a lot of time to hang out and relax. Sam started to get sick Sunday night and has been out of school all week. He's been throwing up off and on, and I took him to the doctor's yesterday. He couldn't find anything seriously wrong with Sam and prescribed Prilosec to help with gastric reflux. Poor boy. He was feeling pretty good for about half the day yesterday, when I stayed home to keep an eye on him. We worked on homework and got caught up where we could. He seemed in fairly high spirits, but took a turn for the worse last night, once again throwing up. This morning he was draggy, but ate breakfast and went back to bed. As for me, I've been trying to keep on top of all my responsibilities, with mixed success. At least the laundry and dishes are done. Snow yesterday, and more today. Yuck. That's all there is to say. The weekend is over, and life is returning to normal. It was a bit of a whirlwind weekend, with lots going on. Still, there were enough moments of enjoyment to make it worthwhile. Friday night we went to Churchill for Crest Drive's talent show. Emma was very excited to see her friends perform, and some of them were phenomenally good. I really enjoyed the Robot Parade number, with all the kids dressed in tinfoil robot suits. The Thriller number was great as well, with all the zombie kids dancing about the stage. The show did run late, and everyone was getting cranky as eight o'clock rolled around. We left before the bananna costumed boys got on stage. Saturday morning involved french toast, and I blew the yolks out of the eggs for future egg making projects. Joanna took Berry and Duncan to ballet, and Emma and I did some egg painting. Upon their return we had a library run, Berry went to a birthday party in the afternoon, and Joanna started feeling lousy after that. I took the kids outside to play as the weather was good. Todd, Sebastian, and Flinn came over to hang out for awhile, and my mom came over to watch the kids around dinner time. Joanna and I snuck away to Off the Waffle, where I indulged myself with a bananna split waffle. She was feeling mostly better, and we played a little Connect Four while chatting away. Sunday was Easter, and the exciting parts ended up on video. Everyone woke up early to find their baskets and devour chocolate. Joanna made eggs and we puttered about until it was time to go to church. The kids had another egg hunt, and we returned home to find Sam had arrived from his mom's house. 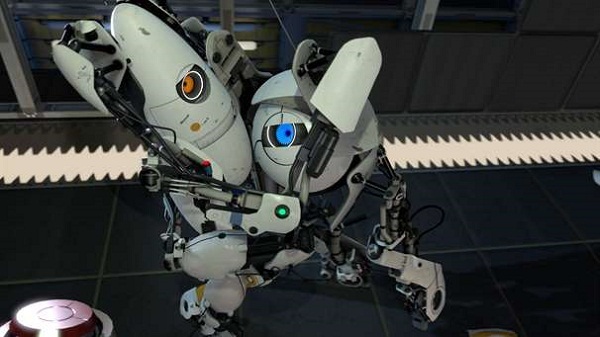 We had some quiet time, and I finished up Portal 2, both single player and co-op with Sam. It was quite fun. The third and final egg hunt began outside with a break in the weather. Everyone got way too much chocolate again. I went shopping with Emma, who was charming and fun. We ate pizza and watched Mythbusters for dinner. After kids went to bed, Sam, Joanna, and I watched the first of the new Doctor Who episodes. The weekend was topped off by a Community episode for amusement value. It was great fun. This morning both Sam and Emma had various illnesses and injuries. Jamie took them to school, and I got a call from Roosevelt from Sam. His stomach was hurting more, so I scooped him up and returned him home. After a bit of a rest, he was able to eat pancakes. I'll check up on him in an hour or so. Poor guy. You kids know that I'm trying hard to do a good genealogy for the respective branches of the Steane, Jones, and Stallsmith-Nunamaker branches of the family. I think I mentioned that two of the Nunemaker brothers (my great-grandmother Susannah Nunemaker's brothers) fought in the Civil War, Joe being killed within six months of enlisting, and Jimmie being captured but surviving POW camp and the war. Meggie has a huge framed photo of him, and has kindly offered it to me. It's badly torn, and would be really expensive to restore to its original appearance, but maybe we fix it enough to make nice clear copies for everyone. Happy Easter! We've had an eventful Easter Weekend. Dad and Anne flew to Albuquerque on Thursday, drove up to Santa Fe, where we met them for dinner. On Good Friday morning, Seraph and I drove down to Espanola and navigated slowly to Chimayo where we met Dad, Anne, and Isabell (She slept over with them). The roads were already packed at 8:30am with walkers. A fifteen minute drive took us a little over a half an hour to arrive in Chimayo. There, we dropped off my car and walked a bit looking for my dad. They were a bit late because of incoming traffic. By the time we arrived in Nambe (10 miiles away), it was already 10:30am. It definitely was the warmest day of the pilgrimages I have taken. It was different having family along as I usually went by myself, however it was fun sharing it with loved ones. The first half of the trip went easily enough with throngs of people in pursuit of happiness, blessings and sore bodies. by the second half our bodies were tiring and our feet were definitely sore. Two miles from Chimayo the narrow roads were overly crowded with cars and the edge of the road crumbled beneath our feet. Three and half hours later we arrived at the Santuario, touched the church, prayed, walked over to the Rancho de Chimayo Restaurant to celebrate and numb ourselves with wine and beer. Overall, we didin't come back to shabby. Seraph had a few blisters and coverted to a red neck (sun burn). Isabell did surprisingly well, and only complained toward the last few miles and only came back with a few sun burned spots. As for Dad and Anne they did very well with a few sore areas. To end it all, they have announced they are getting married in June. Congratulations!!!! Saturday, Isabell had an Easter egg hunt at Dixon and came way like a bandit, and then we all went to Questa to see Grandma, and my Uncle and Aunt. Seraph for some reason or another has decided to have a small Russian Easter today. You'd think she would not miss the chaos of cooking for a heard of small elephants, but she said she missed the chaos and wanted to celebrate with friends and family. As Charlie Brown famously says, "Good Grief!" I, on the other hand, am celebrating Russian Easter next Sunday so my check-off list has been League of Women Voters Annual Meeting, Blazer game, babysitting, and ironing. I'm going to spend the week cooking, so I'll be organized. Perogies on Monday. Like Seraph, I just finished the perogies, easter bread, and chocolate almond torte. And now for a nap. It's the end of a short week, and my morning mocha buzz is fading. It's been pretty low-key the last few days. Our standard babysitters are unavailable, so we've been mostly at home hanging out. My mom has risen to the occasion and Joanna and I are going out to dinner tomorrow night, which promises to be pleasant. Sam's getting out of his cycling class, and at some point I need to fetch his bicycle from his school. I think it was a combination of having to get his bike before each class, and feeling slower than the other kids. Strangely, he really likes his Fitness class. Emma needs to research Dolly Madison this weekend, one of the first ladies. We'll have a fair number of "just the two of us" times this weekend, which should give us plenty of opportunities. She also wants to play the original Portal. Sam is scheming to turn her into a gamer, probably so he has more people to play with. Duncan finished his science project, with much help from Joanna. Gone are the days of little bowls of decomposing paper. Since it was for science, I didn't particularly mind. I'm excited to dye Easter eggs tomorrow. Joanna's already got the baskets ready to go, being the most organized around these sort of events. I'm also hoping to finish Portal 2, and have been waking up at 4:30 off and on this last week. Sam and I have been playing co-op, to our mutual enjoyment. Kulich - check, Pascha - check, Chocolate Almond Torte - check, Perogies - check. Easter season has officially started! Yesterday, Seraph's mock up of the dress came in the mail. 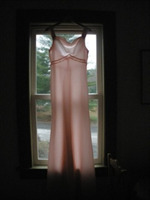 Danica and I are meeting halfway to tailor and style it, then send it back for the final dress. Very cool. The weekend has come and gone, and somehow I find myself at Wednesday. "Tomorrow is an Emma Day!" Duncan exclaimed this morning. Emma was off to the coast with her mom until Sunday night, and both kids had Friday and Monday off, so it was an odd four-day weekend. I took off Monday to hang out with everyone. All-in-all, it was a low-key weekend full of games, playing, and hanging out. Saturday was Berry's friend birthday party. Joanna ran the show like a champ, with egg hunts and Mario-themed pseudo-stained glass projects. To top it off, the birthday cake had Princess Peach embedded within its chocolatey goodness. It went over quite well, and the countless girls invited seemed to have a good time. Sunday was more relaxed. Sam and I went for a long walk down to the library, where he tried out a bagel hotdog. I replaced the fabric for two of our chairs. Emma arrived that evening and we had our traditional pizza and Mythbusters. Monday was just Emma, Sam, and I. We played Apples-to-Apples, Emma tried Portal, and there was a fair amount of playing outside in the sun. We all walked to Adam's school for a picnic, where strangely Sam chatted with friends more than Emma. As for the last few days, they've been homework, Portal 2, and watching Community after kids went to bed. Tonight promises Glee. Good times. It was an odd weekend that preceeded it, full of a weird contest involving potatoes, with the promise of the game unlocking early. Sam and I diligently played games and did video game challenges. Sam practically peed his pants when he first got to play, staying up a bit too late and setting his alarm so he could play again in the morning. I'm training behind him on the single player game, but we got the chance to play the co-op game last night. It's loads of fun, where we control two robots that have to work together to accomplish tasks. Periodically we'll accidentally set the other on fire, crush them, or similarly cause them grief. This typically results in intense laughter between the two of us. There are other games brewing in the background. Minecraft had powered rails added. Soon my elaborate rail system will let people easily travel around our vast Minecraft world. It was Berry's fourth birthday yesterday. It's strange to think that I knew her when she was only two years old. We had cake, opened vast quantities of presents, and generally kept the peace. There were Barbies, princesses, dresses, and lots of books. I stayed home with both Sam and Emma on Wednesday, as we were all pretty sick. Yesterday I went to work, but returned home early to watch Emma, who Jamie dropped off so she could go to work. I tried hard to spend some time with Emma before she went to the coast with her mom today. This morning she and Berry had a good time playing with the new presents. Sam continues to be sick, though hopefully improving. He also lost a tooth this morning, quietly enough. I picked up homework from school and we'll get that done over the next few days. I also need to get him jeans that fit, and hopefully do something active. I made crepes and sausages for all this morning, as Joanna rushed about getting ready for tomorrow's birthday party. I have a bunch of errands to run, and am taking Monday off to spend with the kids. I was told the Internet connection was down, so I'll probably head home early to avert the collapse of civilization. I think they were planning to head outside and start looting. Sam and I are both sick today. Sam has been sick since Friday. I just started this morning. I managed to work, and be surprisingly productive. My nose and throat are quite annoying at the moment. We rounded up some of Sam's homework, and I'm putting him to work getting ready for his return, hopefully tomorrow. I'm back at work. Sunday was extremely lazy and low-key. The kids all played together. The grownups made breakfast. My dad came over and we chatted away, hoping to come back again relatively soon. We loaded up the car, hooked everyone up to their media player of choice, and made the long ride back into town. Sam got a little car sick, so I slowed down on the curves and we fed him ginger. It took about an hour to unload while kids played Minecraft. Sam did exercises while I put Emma to bed. That night we watched old Star Trek and I worked on laundry. This morning Sam was being a little sick still, so he's taking it easy at home. He seemed so perky at the beach that I thought he was over it. Poor boy. I'm at dad's beach house at the moment. Berry's watching a Barbie movie next to me, Dez is sleeping on the couch, and everone else is sleeping in a bit longer. It looks like a cloudy, hazy morning, gazing out the windows over the bay. If the weather isn't too horrible, maybe we'll explore a little. Friday night Joanna and I went to Laughing Planet for dinner. I had the chili and enjoyed playing with the plastic dinosaurs on our table. We then wandered next door for a decaf mocha and listening to music. Returning home, I tucked in Emma and started getting ready for our trip. 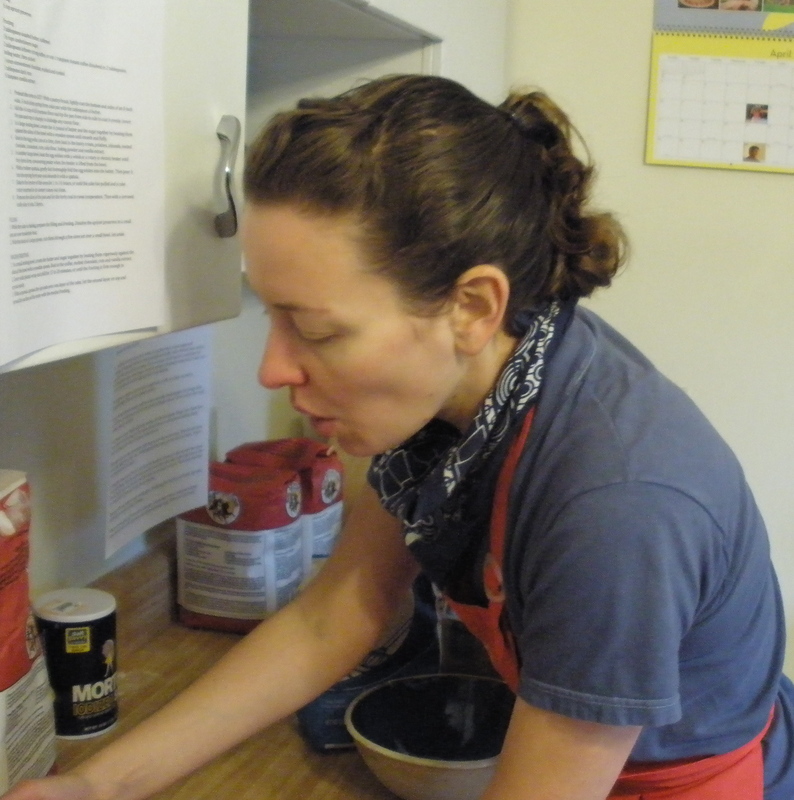 I was a little frantic Saturday morning, deciding to make regular and gluten-free crepes for breakfast, as well as get everything packed and car snacks prepared. With the help of tea and espresso, I made it through the morning. Jamie dropped off Sam, who evidently threw up that morning, but was otherwise chipper. The van ride began and went surprisingly well. Joanna got some homework time in, and everyone else played or watched shows. We rolled into Newport just when everyone had to pee, and miraculously parked a half block from the ships. We ended up having a massive lunch at a little place with the tall ships in view. I ate a pancake bigger than my head. Sam ate vast quantities of food. Emma nibbled on her clam chowder, then ate the rest of my pancake. Kids played with toys. Sam and I played cards. Eventually my mom, dad, Jenny, and her kids arrived and we boarded the ships. 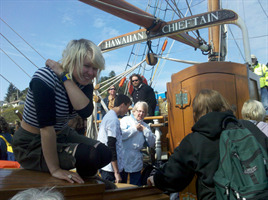 We ended up on the Hawaiian Chieftain, heading out to the bay and raising the sails. Sam and Dez were Shanghaied into service belaying ropes. 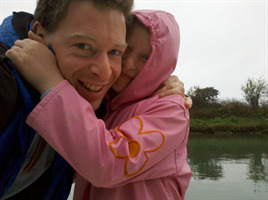 We briefly got out to sea and the waves were knocking Berry about with a smile. Evidently the other ship was crewed by cowards, so we turned about and rejoined them in the bay. Eventually the gunner came out and began firing off cannons. It was loud and exciting at first, though after a couple hours of this everyone started looking forward to shore leave. My mom thankfully brought snacks, a serious oversight on my part. We landed, thanked the crew, picked up pizza, and drove to my dad's house. It's quite nice, built right up against a nature preserve on the bay. There's a little dock where he hopes to get a small boat to putter around with. Sleeping arrangements were tight, but not impossible. Sam ended up in the office, and Emma with grandma Sue. I saved Duncan from being woken up by a chipper Berry, taking her downstairs for a show. Joanna is getting her beauty sleep. All-in-all, it's been a great trip so far. I figure we'll be lazy this morning, and either putter around the beach a little, or head home to hang out for the rest of the day. Just got back from a fire drill, made to stand outside in the cold while in the middle of an interview. We're hiring a position at work, and I'm liking this current person. Humor is an important quality. It's been a busy, but good week. Wednesday night Joanna and I had a hot date at Joann's Fabrics and the grocery store. Sam's been working away at homework, thinking about getting out of his cycling class. Last night we picked up Emma from Coyote Kids, which she really enjoyed. After getting homework done and kids in bed, Sam, Joanna, and I watched Nick and Nora's Infinite Playlist. It was a quirky teen comedy, and generally enjoyable. Both Sam and Emma were reporting illness this morning, and Jamie took them to her house. Sam actually wanted to go to school, as he's been teaching his friend Evan to play Magic and they had a tournament set up. I think Evan is a new buddy, and he jumped on our Minecraft server briefly the other night. Tomorrow is our big trip, and we're coordinating with Jenny, dad, and mom. I'm getting the technology pieces together, loading up laptops with movies and shows. It sounds like meals are generally taken care of, especially the all-important pizza and Mythbusters. Tonight Joanna and I are going out for dinner and music briefly, then getting ready for tomorrow. Busy, busy. I've been watching the rerun of The Civil War series on PBS. It's hard to imagine that my great-great uncle, a Union soldier only three years older than Dez, was killed at the Battle of Bushy Run. Emma lost a tooth this morning. She'd been spending days playing with it, and now it's no more. I also signed her up for Coyote Kids, the last slot. She had a good time doing it last year, and she's excited to go along with her friend. Fortunately Kate's dad will be picking her up, so I won't have to get out of work early. The weekend has come and gone, and I'm sadly back at work. Joanna's at home, taking care of Berry. I went into her room to check on her getting dressed progress, finding her in tears saying there was throw-up in her mouth. I rushed her into the bathroom where she proceeded to throw up more in the sink. Duncan was fascinated. Sam went to Jamie's house Friday night, and Joanna took B&D to their rehearsal. Emma wanted to swim, so off we went to the pool. It was low-key and fun. Emma liked the part where she got to surf me. Saturday morning was pancakes - chocolate chip ones for the kids and blueberry for Joanna and I. I took the kids to the library while Joanna finished a paper for school. We loaded up on books, then I took everyone to Sweet Life for goodies and dropping off Sam's rented trumpet. Next was cheese park to run around in the brief window of sunshine. Berry managed to get herself very muddy while Sam called. I chatted about Minecraft while digging her shoes out of the mud. I picked up groceries and pizza with Emma, picking up Sam and returning for the Rough Science finale. Sam, Joanna, and I watched The Social Network that night, which was quite interesting. 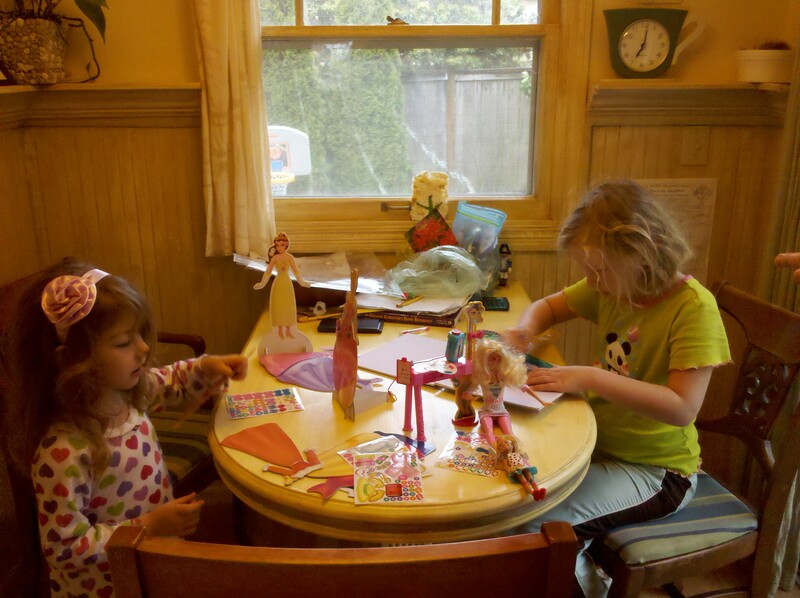 Sunday we had a tasty breakfast, played a lot of Minecraft together, did some homework, and mowed the lawns. I took everyone to the playground at Adams Elementary. Kate came over to play with Emma for a couple hours. Joanna took Berry and Duncan to their play. Sam and I played a lot of zombie games, and decided to build a carnival in Minecraft. That night we had my family over for dinner, and there was much eating of desserts and running about. The night wrapped up with Sam, Joanna, and I watching Chuck now that we're finished with Doctor Who. Tonight both kids will be at Jamie's house. Next weekend we're off to Newport to take part in a ship battle. Sam's skeptical, so I've got to work on my marketing a bit. It's been a sad weekend down here. On Friday night one of my co-worker's (Alan) son died in a car accident. He was about my age, and while he'd had some rough times, he was one of those people everyone like. Isa and I will be going out to the families property tomorrow, where he'll be buried. Isa sadly pointed out that this is the second funeral she's attended since we moved here. This morning I said fairwell to Sam and Emma, gave Joanna a kiss, joked about with Jamie, and took Berry and Duncan to school. After adequate jumpies and shakies, I headed into work, got my mocha, and settled in to read email. Work continues to be fun and pleasant, with the undertones of people leaving at a pretty steady pace, unsure of when their job will move. My current plan is to stick it out and see what happens. The week has been generally pleasant. Sam's been adjusting to his new term, with is generally the same as his old term except for his electives. I think he's generally liking the fitness and biking classes, though he's not quite sure what he's going to do with his bike overnight. He may end up biking to and from school, which was part of the plan from long ago. Joanna and I haven't gotten too many date nights in lately. Wednesday we slipped out to Sweet Life. She's kinda gotten a promotion at work, or at least she's survived the surprising amount of layoffs in her department. It's been a bit stressful, but I'm hoping things improve from now. Maybe we can get in some swing dancing next week. Joanna, Duncan, and Berry are doing church plays this weekend, so Emma and I get some alone time tonight. Next weekend we're going on an epic trip to visit the sailing ships in Newport, riding out to sea and engaging in a sea battle. It should be quite memorable. Life is interesting, busy, and good.